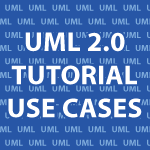 Welcome to my UML 2.0 Video Tutorial! In this series I will cover Use Case, Activity, Class, Object, Sequence and many more UML Diagrams. Unified Modeling Language (UML) is a graphical way of describing software systems. In this tutorial, I’ll focus on Use Case Diagrams which list the steps a system needs to follow to reach a goal. I’ll walk you through the parts of a Use Case Diagram as well as the requirements of a Use Case Description. It starts slow, but quickly it will dramatically improve your ability to create robust systems. The user enters their card and PIN. Security verifies the card. The user selects the account to use. They select an amount. Security verifies if the amount is available. The system comes to a conclusion on if money is provided. The user selects funds as $10s or $20s. Security provides the funds if possible. Security provides a receipt and the users card. I am sooo enjoying your tutorials. I am working the UML track, and found parts 1, 3, 4, 5, and 8 but I have to start each one to know the sequence number, and well, I can’t find number 2 at all. Your tutorials are fantastic. Please keep up the great work! Great tutorial Derek,nice website its been a one stop shop for me soooooooooooo…. Much content. I’m in college doing computer programming 101 we’ve covered Java,GUI and we’re doing SAD now and your vid’s have been invaluable to me and I’m sure too many other people aswell, you cover EVERYTHING Thanks and keep up the good work. You are very very welcome 🙂 I’m very happy that you find them useful! You are awesome Dude. These tutorials are very enjoyable. This is my favorite pass time now, I come from work and watch your Videos till I sleep. If you can, can youplease share your power Points and the Use Case Diagrams that you showed in this lecture. Thank you very much 🙂 I’m very happy that you are enjoying them that much. I don’t have the power point files, but I have every UMLet file used on this page UML Video Tutorial. You’re very very welcome 🙂 Thank you for stopping by my site. thanks a lot for your effort. i wonder if i u can upload your uml files u use in the video?